At the end of every year I like to look back on my blog and reflect on the things I made, the places I went, and my most popular fashion outfits I created. I've already posted My Favorite Home, Hobby and Crafting Projects of 2017 and A Summary of Our 2017 Travel Adventures. Today, I will share my most popular fashion posts of 2017 based on how many hits they received that month. 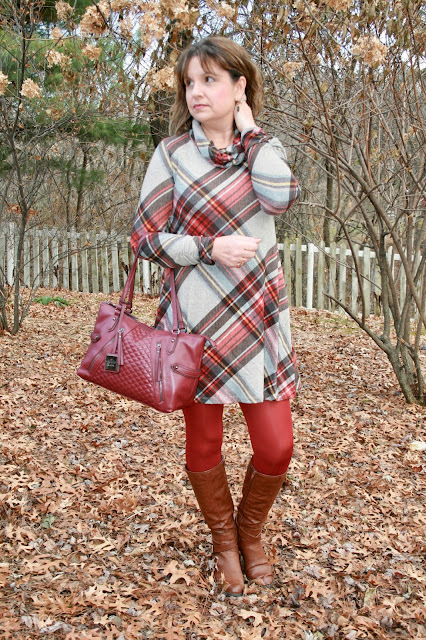 In January, my most popular fashion post at 897 hits was My Go-To Winter Outfit: Sweater, Leggings, and a Puffer Vest. One year later, I would say this is STILL my go-to winter outfit except I'd probably swap out the leggings for jeggings today because I like the coverage better. With February came Valentine's Day so it's no surprise that A Casual Valentine's Day Outfit was the hit of the month coming in at 746 hits. 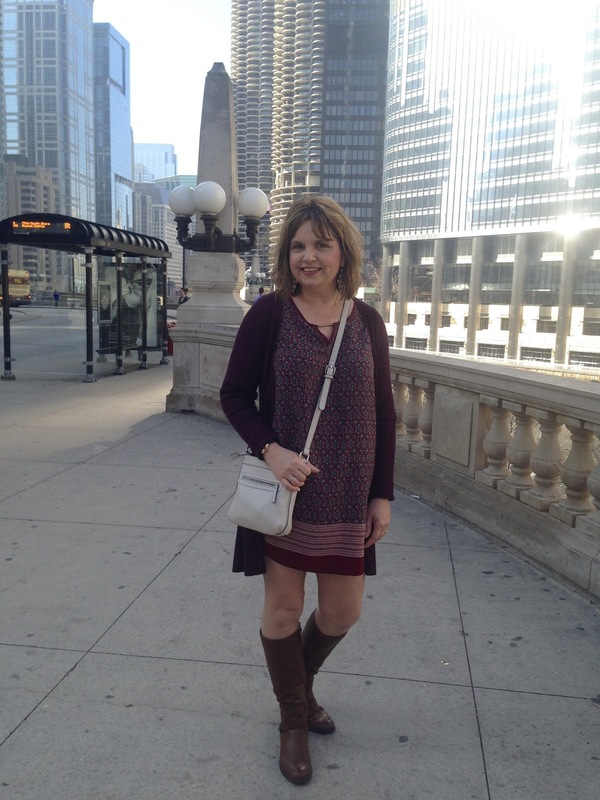 What I wore on a crazy warm 70 degree day in February in Chicago came in first for the month of March at 804 hits. It must have been because it was the month of April Fools Day, because for some crazy reason a simple post of "How To Wear A T-Shirt And Jeans" came in first for the month at 996 hits. 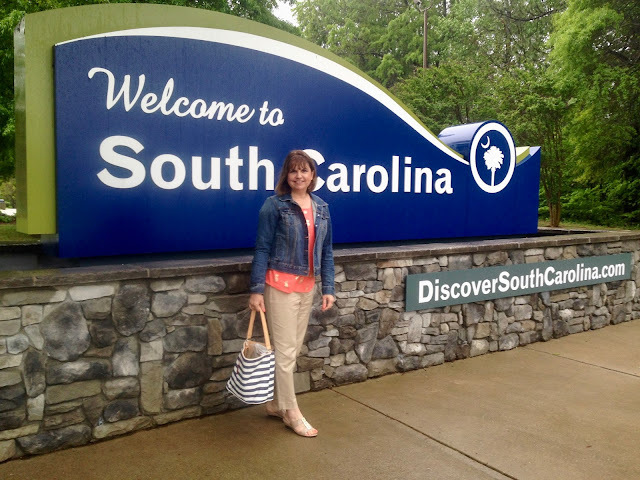 What I Wore On My Vacation To Myrtle Beach came in first for the month of May at 1009 hits. 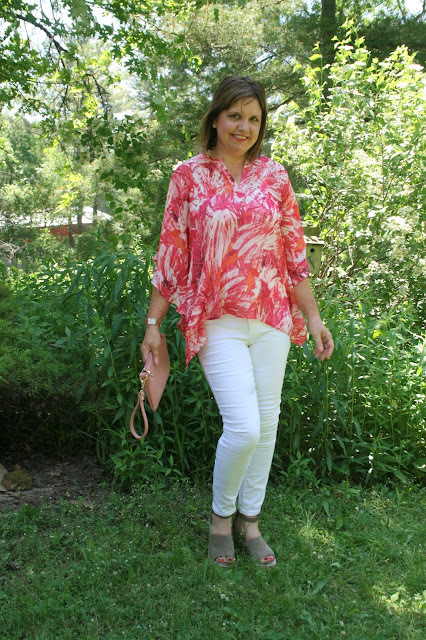 My Summer Stitch Fix review came in first for the month of June at 797 hits. How To Wear A Midi Skirt and Not Look Frumpy not only got the most hits for the month of July, but also the most hits of all the fashion posts for the entire year, coming in at 1091 hits. 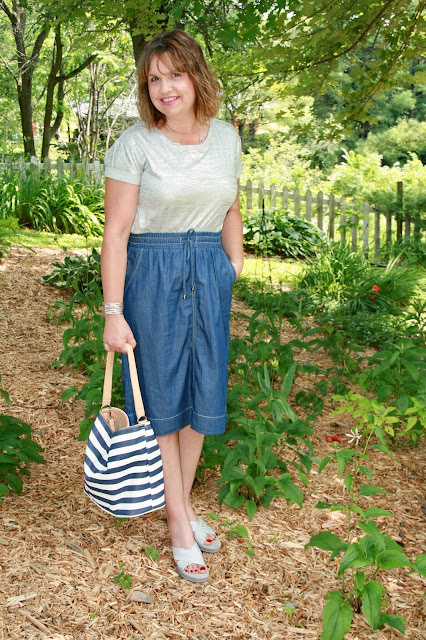 Hmmm, I wonder if a lot of women struggle with styling midi skirts like I do. Grandma and Me: A Very Special Link Up took the number one fashion post of the month at 704 hits. I was thrilled to see it so popular and I have since made this a monthly feature on my blog. In September Transitioning A Summer Dress For Fall came in as number one for the month at 507 hits. How To Wear A Long Cardigan was number one for the month at 580 hits. Chenille: A Fabric I'm So Happy To See Return Again took the number one spot at 454 hits. And finally, A Plaid Dress For Winter finished off the year with the number one spot at 454 hits. As I look at the most popular fashion posts of the year, I am always surprised at what my readers liked the most verses what I like the most. Other than the dress above, I don't think my personal favorites even made the top twelve. That's why I always take pictures of what I wore, whether I like the outfit or not, because I never really know what my readers will think. I think one thing though comes across very clear: women aren't looking for glamorous outfit ideas. They are looking for ways to style the simple items they already have in their closet: T-Shirts, Jeans, Leggings, etc. And that is what my fashion posts will almost always be about, because I lead a very casual lifestyle and I don't have a need for fancy clothes or work clothes. I really like your outfits. It's difficult finding attractive ensembles that are either too young or too dowdy. I'll be sure to follow. I'm glad I met you at Blogging Grandmothers. Have a Merry Christmas -- BTW who is your photographer? Thanks Marisa. I so agree! I've struggled myself looking for over-fifty fashion inspiration that incorporates the fashion trends for a over-fifty woman. My husband does 95% of my photography and absolutes loves it. I am blessed. My daughter does the remainder. Nice to meet you through Blogging Grandmothers too! It's so nice to look back at the outfits! Love them all ... my favorites are January February, April, August and October. Looking forward to more fashion posts from you next year! Thanks so much Elli! I love hearing what people's favorites are. It's so interesting! I love this round up, and you had so many great looks this year! My personal favorite is the long cardigan from October. I hope you have a wonderful holiday! Thanks Rachael! That cardigan seems to be very popular. I actually considered donating it because I wasn't sure about the fit, but now I think I'll hang onto it a bit longer. Oh I'm glad that cute post with your granddaughter was featured as it's easily my favourite! :) It's interesting seeing what my most popular posts are - often I have no idea why, haha! Thanks Mica! I was happy to see that as well. And yes, I so agree about how interesting it is at the end of the year to see what the most popular posts are. Now I'm tempted to do "MY Favorite Fashion Posts of 2017" because they'd be so different. So many great looks! I think the fall months are my favorite and January's. I need someone to come style and shop for me! You look great. 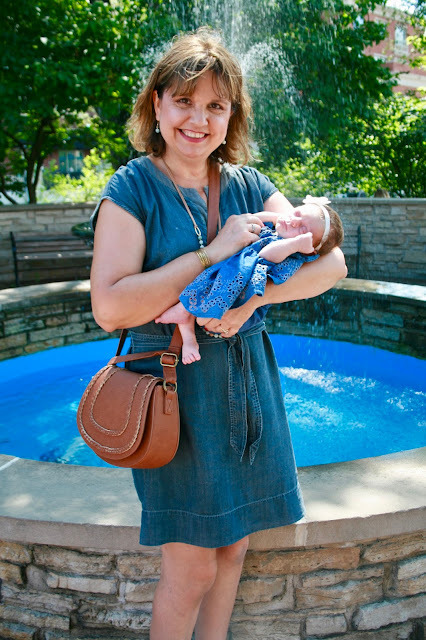 I love your January look and of course the one with your granddaughter! So cute Amy! Thanks for linking up to Top of the World Style. I wish you and your loved ones a happy New Year. Thanks Nicole; same to you! Fantastic review of the best of your 2017 blogging year. I hope that you've had a wonderful holiday season and that the year to come is full of joy and prosperity for you. Thanks Rena! It was a wonderful holiday! We had our last party last night, now it's time to take down the decorations and return to normal. Great outfits! It's very difficult to pick favourites but I'm drawn to the last two. I enjoyed seeing how you dressed for the changing seasons. Thanks for linking up, wishing you a very Happy New Year! What a great post Amy! Hi Amy, I've really enjoyed seeing a review of your outfits all together. You look great in all, but my particular favourites are January, February, June and November. ps: I wish I could looks as slim in leggings as you do - I'm wearing leggings for the first time this winter - inspired by you - but I have to make sure I wear something to keep my hips covered! Aww, thanks so much! I'm sure you look great in leggings too! I find that short dresses make great tops to wear with leggings in the winter if your looking for something to cover your hips. It's hard to find tops that are long enough.